Bahia Bustamante is a private sheep farm in Argentine Patagonia. Spread over 210,000 acres, it is about 1,000 miles south of Buenos Aires. You visit this isolated outpost to enjoy one of the few places in the world left with such an enormous variety of plant and animal species in a relatively small space. 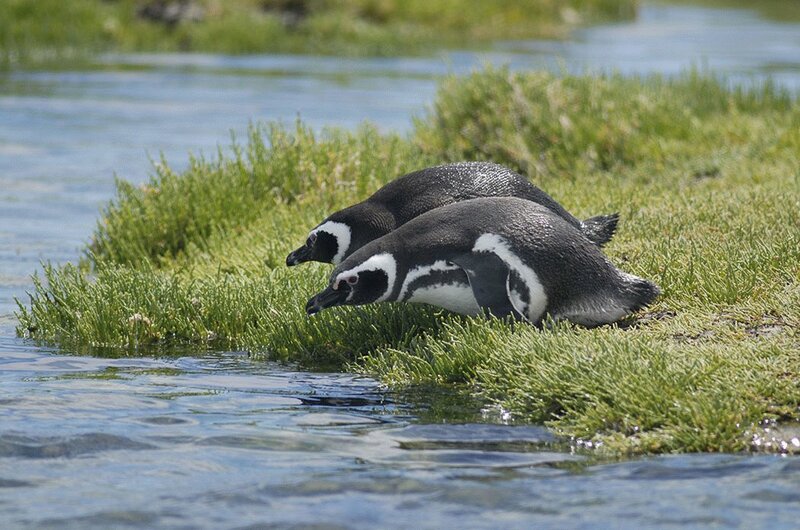 Domestic animals including sheep, dogs, cats and horses roam freely across the farm, but the highlight at Bahia Bustamante is the wild marine animals, which include penguins (100.000), sea lions (4.000) and a huge amount and diversity of marine birds. 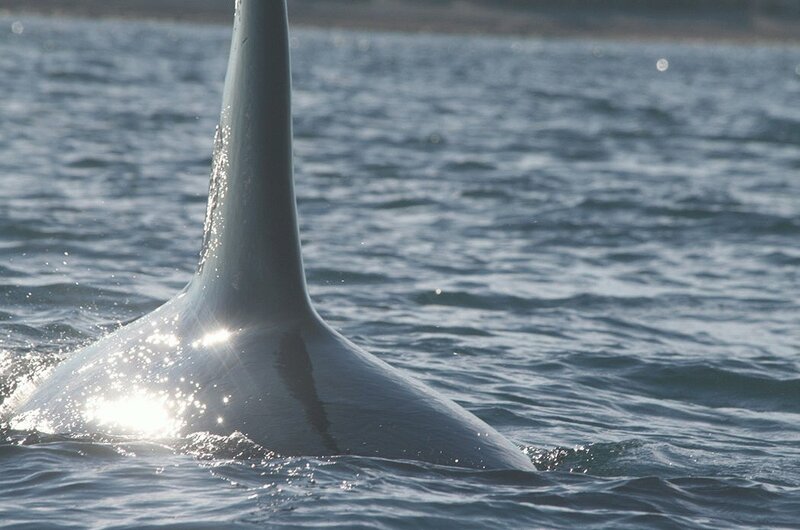 Only a few places in the world house such a number and variety of seabirds and marine mammals, which is why it is included in the National Park “Patagonia Austral”. 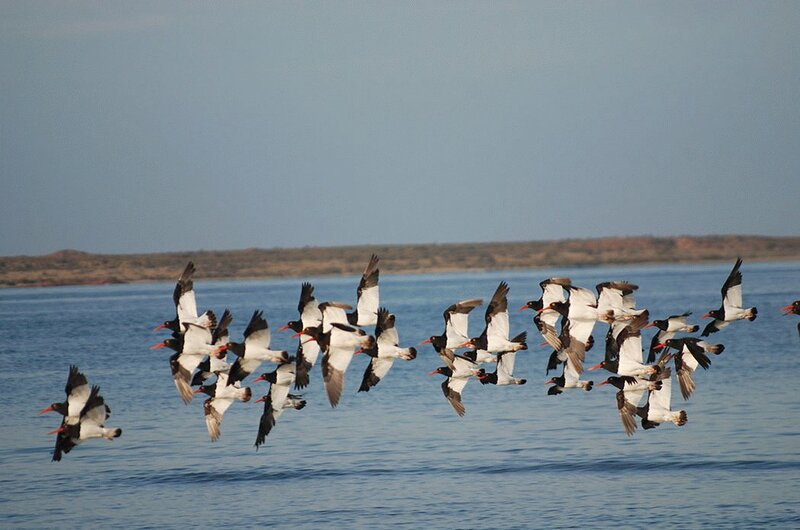 For ornithologists, there is an infinite number of species in the region: Steamer ducks, egrets, gulls, vultures, falcons, red knots, hawks, albatrosses, eagles, skuas, red plovers, with several species that don’t exist anywhere else in the world. Attracted by the verdant breeding grounds royal cormorants, rock cormorants and giant petrels all stop by, the latter have six-foot wingspans and can fly 200 miles out to sea. What To Expect At Bahia Bustamante? Bahia Bustamante is truly in the middle of nature, hundreds of miles from any other urbanisation with unending skies and undulating landscapes ranging from pockets of the desert, uninterrupted swathes of pastureland, dunes and canyons to the rugged Atlantic cliffs which drop down beaches and the wild and deep blue ocean. Mr. Lorenzo Soriano (Baeza, Jaen, Spain, 1901-1987) arrived in this area in 1953, searching for seaweed which would enable the production of “Malvic” hair gel, which he produced from 1947. 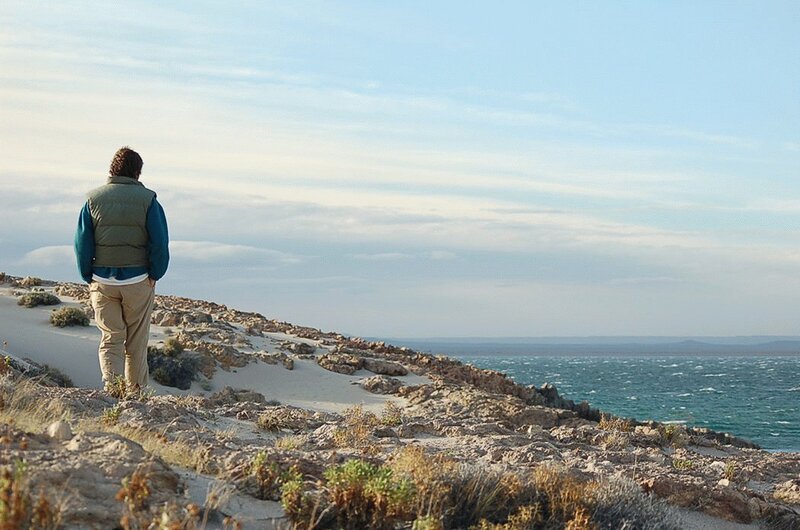 After travelling all over the Patagonian coastline in search of seaweed, he discovered Bahía Bustamante, known then as the “Rotten Bay”, due to the accumulation of rotten seaweed. He decided to carry out a preliminary research and then, together with his four sons, started the seaweed harvest. It was at that moment that this exclusive village was born. Back then, there were only two constructions by the sea. They settled there and began to build Bahía Bustamante. They built houses and rooms for more than 400 employees, with its own school, church, police station, warehouses, workshop and grocery store, among other things. Today, with only 30 inhabitants, this small seaweed town has opened its doors to travellers, offering the exclusivity of being surrounded by 360 degrees of nature and with access to an incredible diversity of fauna. Since December 2008, its coasts are part of the National Park “Patagonia Austral”, which protects 1 marine mile from the coast and around 50 islands. 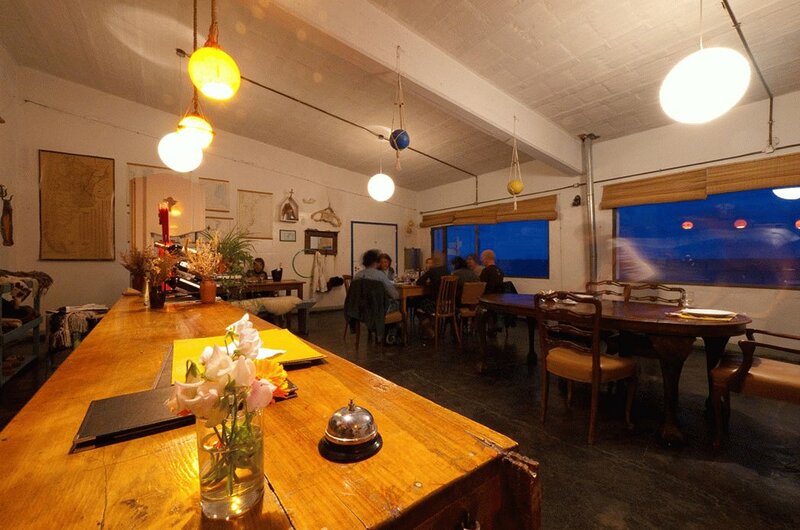 The old grocery store houses the common areas of the hotel and has an old world Patagonia atmosphere. The club is a games room with pool, ping-pong and table-football. 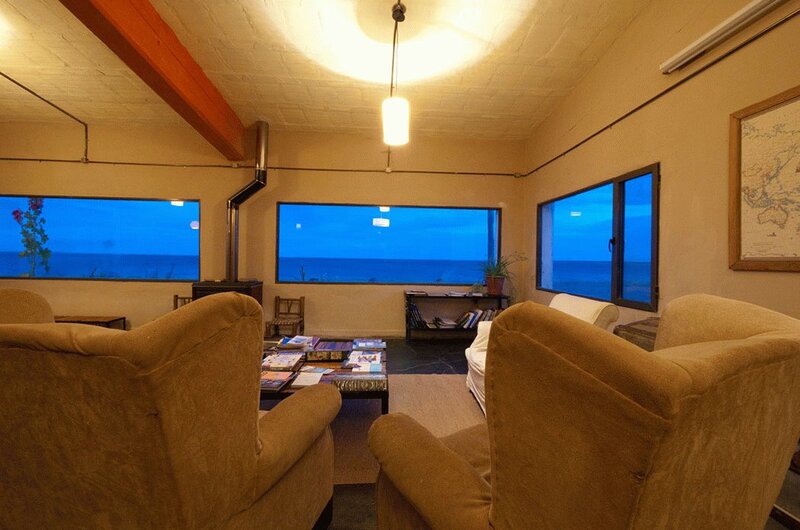 The bar and living room is the perfect place to relax while watching the sea through the immense windows and enjoying the special lighting & fabulous sunsets that the Patagonia offers. The bar is situated in the corner of the living room. In the small library, you will find works about birds that inhabit the local shores left year after year by the Biologists. 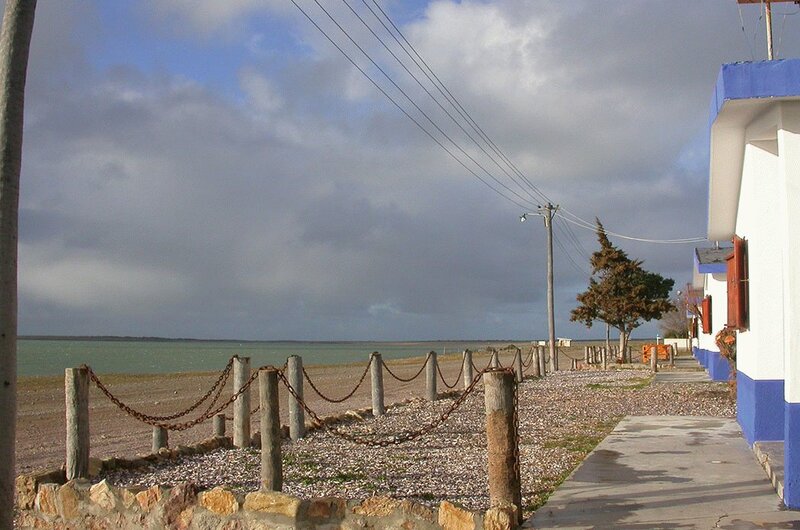 There is also a local museum which contains a collection of old photographs of the village and its old ways, showing the first steps of the seaweed industry worldwide, that took place on the coast and how Bahia Bustamante was born in 1950. The most luxury rooms at Bahia Bustamante are located across six sea view houses. 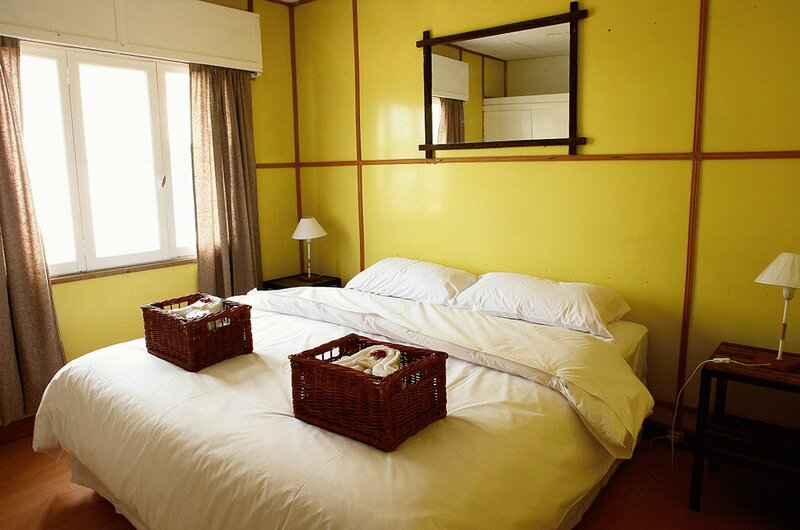 Each house has 2 very comfortable, simply decorated bedrooms, living room, and fully equipped bathroom. Mini bar & ocean front view terrace. The hotel includes full board (except beverages) and activities, which are coordinated the night before and are subject to weather conditions & tide tables. Bicycles are also complimentary. Simpler rooms are set up in five Steppe Houses, located at the edge “village” where the steppe landscape begins. Each house has one double room, dining room, bathroom, kitchenette and a small living room with a single bed. This option does not include activities or meals. The maximum capacity of each house is 3 people. The restaurant serves regional food based on typical products of the area: seaweed, different kinds of meat, fish and other marine products and fruits and vegetables from the organic garden all make their way onto your table. Meals are hearty, country fare with lentil based dishes, hearty roasted vegetables along with fresh fire-roasted lamb all washed down with a few bottles of Patagonia beer. Worth noting is that there is Wi-FI available in the common areas while the generator is on. Please keep in mind that since it is satellite, the service is very variable. ?Unsurprisingly there is no cell phone signal. We have a telephone at disposal. SAILING ALONG MALASPINA COVE VISITING SEA LION AND SEABIRD COLONIES: After taking breakfast, gather at the grocery store and assess the weather report and the tide tables to determine whether sailing is possible. If it is the group gets on the boat and sails along the seaweed fields where you come across vessels working on the seaweed harvest. Later you sail on the mussel crops and tell you all about the breeding online system in use. Finally, arrive near the islands that are within the cove, approach the Roca Malaspina to continue sailing down the archipelago made up by the Vernacci Islands. 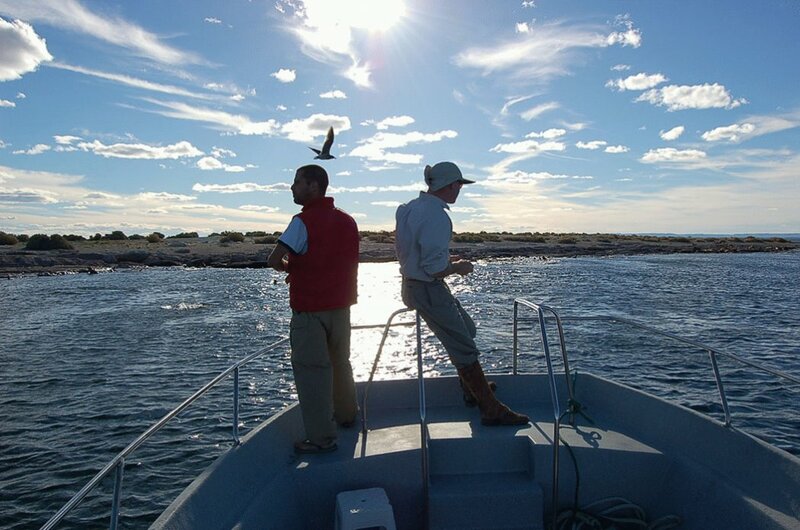 While sailing, contemplate Sea Lion colonies (4000 animals during the breeding season), Magellan Penguins (100.000 – Season: October to March) and colourful Marine Bird colonies. Then the boat is moored and returned to the village. THE PENINSULA (4 hours approx. ): Graviña Peninsula is a 70 km Peninsula of sandy beaches, crystal clear water and reddish rocks. Biking, trekking or 4×4 are possible, this will depend on the preferences of the group. 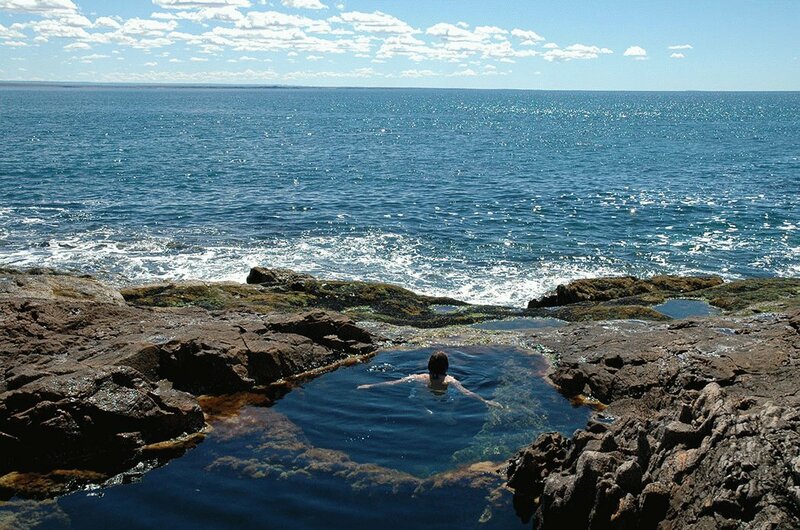 If the tide is low, natural swimming pools are formed in the rocks, ideal to take a bath if the weather is good. The peninsula also houses an archeological site. PETRIFIED FOREST (4/5 hours approx. ): A 4×4 ride combined with trekking to the Petrified Forest, located 18 miles away from the town, within the limits of the land. Once there, we will travel 60 million years ago interpreting the different pieces. On foot, we arrive at “The Pyramid” where it is possible to listen to the Patagonian silence. During the visit, we will be able to observe all kinds of Steppe fauna too. This activity can also be done riding, with an extra cost.
. their nests closely. 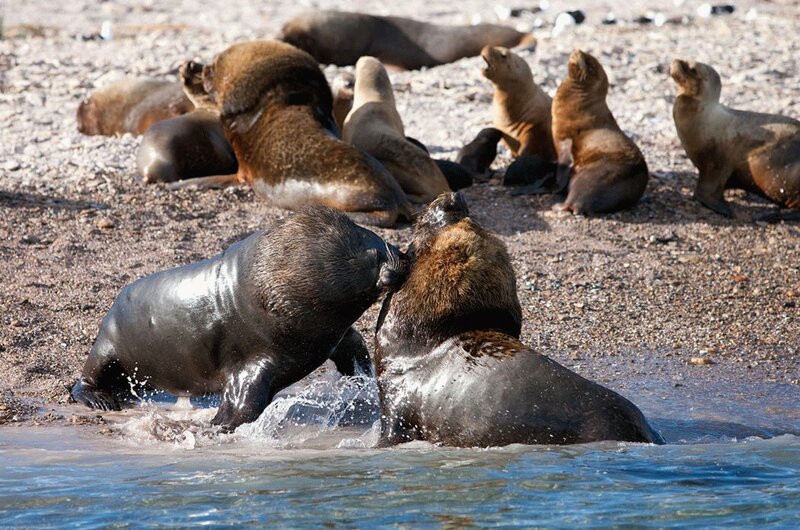 On the way we will also be able to find all kinds of Steppe fauna.
. will trek to see Sea Lions, which usually rest here. 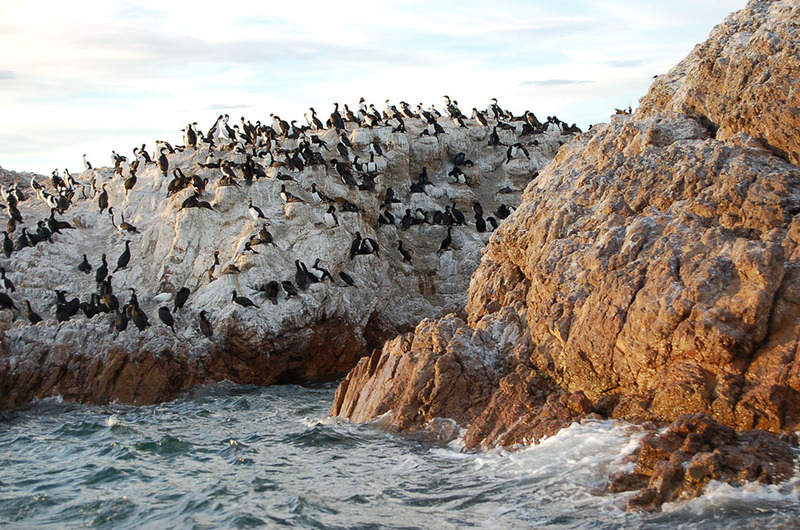 This is also a nesting area for many kinds of marine birds. ROCK CANYON (4 to 5 hours approx. ): Beautiful trekking down the canyon, an area which used to be a river and is now dry, offering the possibility of trekking until reaching the sea. Its 15 mts walls are formed by Jurassic rocks, from the Mesozoic era. During high tide it is possible to swim in the natural pools and it is also an archaeological site, since aborigines used to visit this area too. The place has special weather conditions, which make it ideal for bird watching. RURAL ACTIVITIES IN A TYPICAL PATAGONIAN RANCH (4 hours approx. ): Bahía Bustamante is part of a group of 3 Estancias which add up more than 80.000 hectares. In Estancia Las Mercedes you will understand the production process of wool and meat, and according to the season, you may participate in a day’s work, visiting the corrals and learning about the different activities carried out: shearing, weaning, classification or marking of the sheep. Other activities include Trekking, Mountain Bike / Activities with an extra cost: Horseback Riding, Kayak, navigation in private Zodiac. Bahia Bustamante doesn’t do any marketing; this place is on a need to know and recommendation basis. It is one of the few true secret destinations left in the world. This isolated and unique ecosystem is a dream for any naturalist. If you appreciate the massive grandiose of nature and want a private and unique place to enjoy our planet earth, you will surely love Bahia Bustamante. 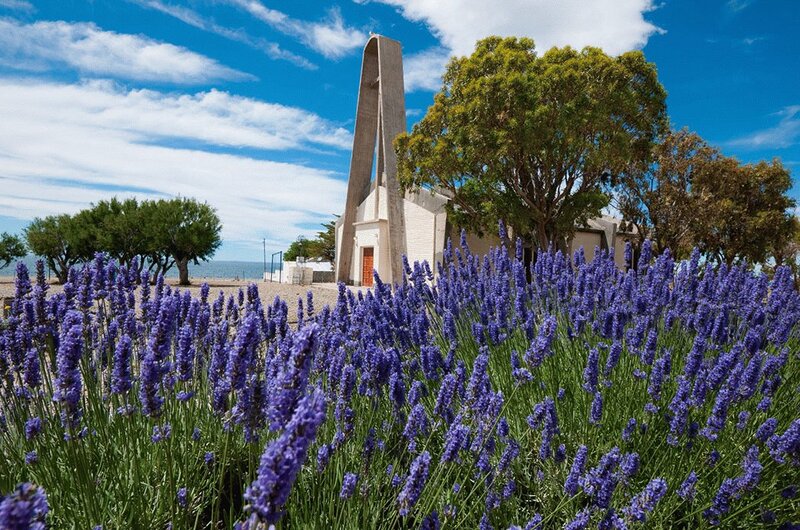 Get to Bahia Bustamante from Buenos Aires by flying to Comodoro Rivadavia or Trelew Airport. It then takes several hours in a Jeep before you arrive at the isolated and beautiful Bahia Bustamante.